Since putting this up originally I’ve changed my microscope – the Wild I now use is described, but I also more recently bought a Chinese AMSCOPE zoom trinocular microscope because I wanted to have a digital video camera that showed my work while it was in progress for demonstrations – unfortunately the cheap trinocular microscopes you can buy all seem to work by switching out one eye in order to use the camera, so you cant work normally and show it to a screen at the same time, so it didn’t do what I wanted it for. It is, however, a perfectly good microscope, and I’ve fitted a pillar for a headrest in place of the digital camera mount. Mine came with a very good stand with a sliding arm and quite a long reach, and it has the slight advantage over the Wild that the eyepieces have a longer ‘eye relief’ so your eyes can be further from the eyepiece lense and its easier to keep your glasses on. The zoom isn’t much of an advantage compared to the 3 stage click magnification of the Wild as its easier to get the scale of things if its one of 3 magnifications. All in all it is a perfectly acceptable microscope and for our purposes there is not much to choose between it and the Wild which probably originally cost 10 times as much, and even second hand cost 50% more. ( I paid £600 for the Wild with case and stand and light, the Amscope was £422 with stand). as of Oct 2018 I mostly use the Wild microscope in my workshop and the Amscope for demonstrating as it saves disturbing the Wild. The starting point for engraving is the tools, for me that’s mostly push gravers, and mostly square gravers. Since engraving steel wears the tools very quickly, and the biggest cause of slips and errors is blunt tools or broken tips, you won’t get anywhere until you have got the equipment and skill to sharpen your gravers – there is no short cut to this. Experienced engravers can (mostly) sharpen their tools by hand without jigs or guides but for ordinary mortals it is not possible. Disbelieve me at your peril! Part of my setup – the tools are mostly squares sharpened the same way so I only have to stop and sharpen tools when I have blunted a number. 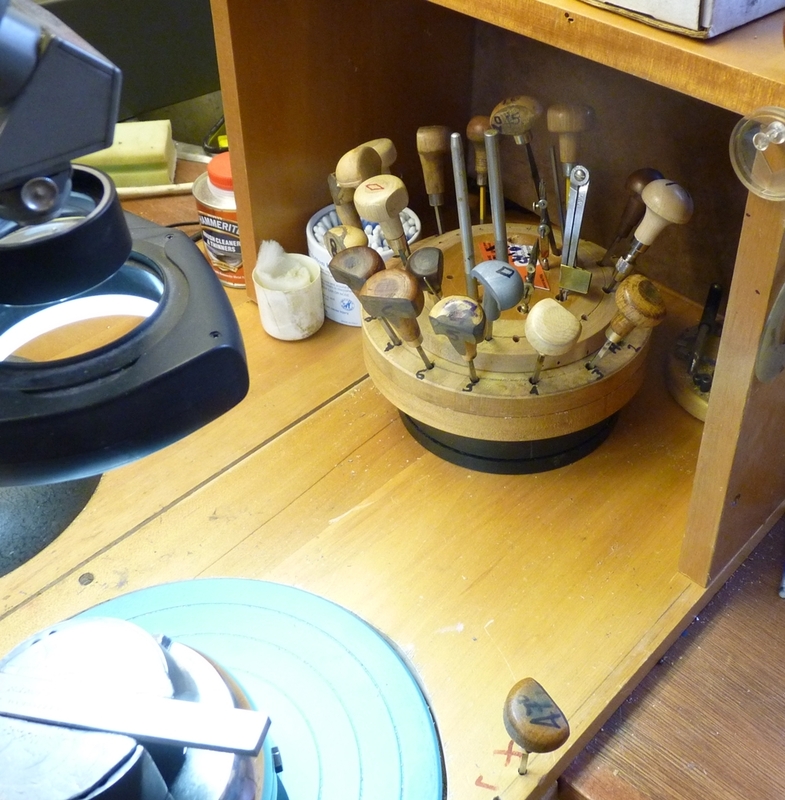 There are a few other tools – knife and ongulet and some lozenge.